Jewel Cave National Monument is one of several National Parks, Monuments and Historic sites located in the Blackhills of South Dakota. The Blackhills combined with South Dakota National Parks makes for an epic All-American bucket list road trip! What are you waiting for? It’s time to start planning a road trip of a lifetime! 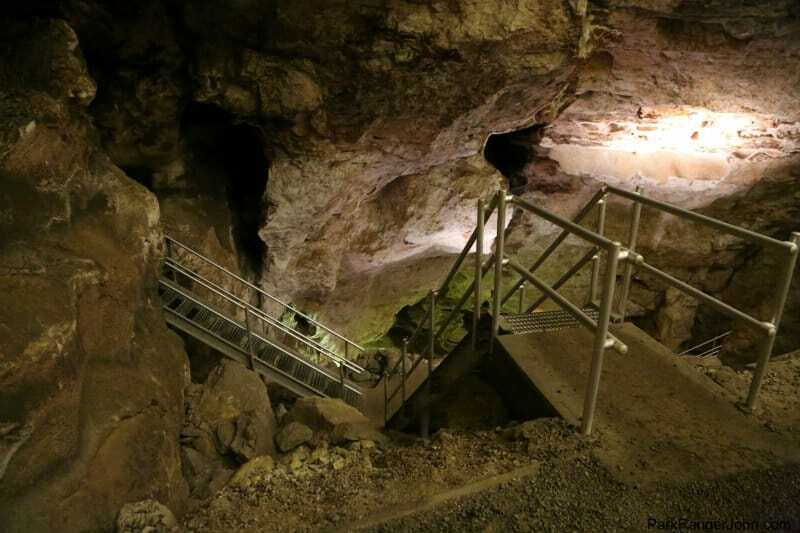 Here are my tips for visiting Jewel Cave National Monument. It’s the third longest cave in the world with over 180 miles of mapped passageways! It is funny to think when Jewel Cave was discovered in 1900 they thought the cave was super pretty but also a very small cave. Over time as people explored the cave they have now mapped over 200 miles within the cave system. In 1972 the National Park Service completed the new visitor center, elevator, and tour trails. The jewels which give the cave its name are sparkling calcite crystals. This is just one of the types of speleothems which are cave formations seen during a tour. You may also get to see stalactites, stalagmites, flowstone, draperies, and popcorn as you explore the underground wilderness within the cave system. I am always surprised by the brilliant color within the cave so far beneath the Black Hills. 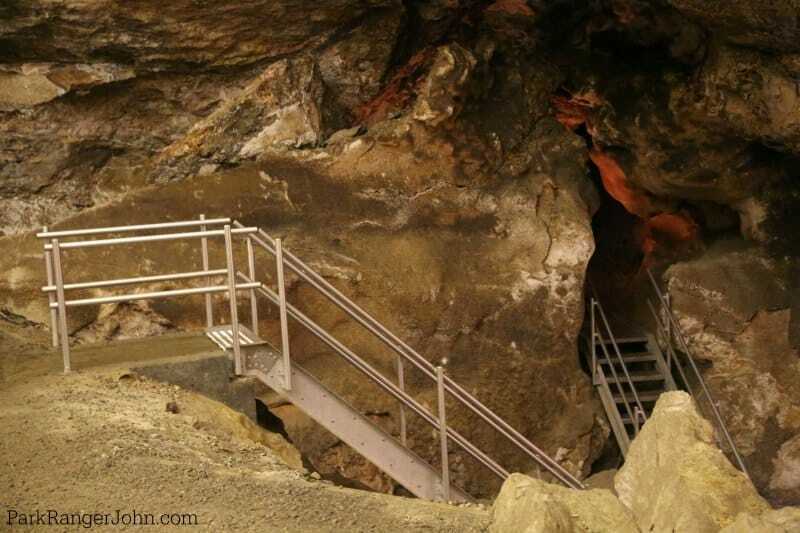 Did you know that the cave stays a constant 49 degrees Fahrenheit year round? Make sure to pack warm clothes if you get cold easy. Also, keep in mind that tours fill up quickly in the summer months. People often wait in lines for hours to try to get a ticket to enter the cave. You must be on a Ranger guided cave tour to enter Jewel Cave. Tickets are available on-site, in person, on a first come, first serve basis on the day of the tour (same day tickets). Cameras are allowed on the Scenic and Discovery Tours, small cameras that will fit into your pocket are allowed on the Historic Lantern Tour. Make sure to leave your monopods, tripods, selfie sticks and GoPro Sticks as they are not allowed in the cave. Items Worn in Other Caves outside of the Black Hills are Not Allowed. A disease known as White-Nose Syndrome (WNS) is killing bat populations across the U.S. To prevent the spread of WNS – do not wear shoes, clothing, or bring any gear into Jewel Cave that has been in other caves or mines. There are four different tours to choose from. This tour is offered year round and is a short 20-minute tour that is ADA Accessible. The tour is available year round and is 20 minutes long giving you a great introduction to the cave. This is a moderately strenuous 1/2 mile hike in the cave with over 700 stairs to climb so make sure that you are up for this challenge. 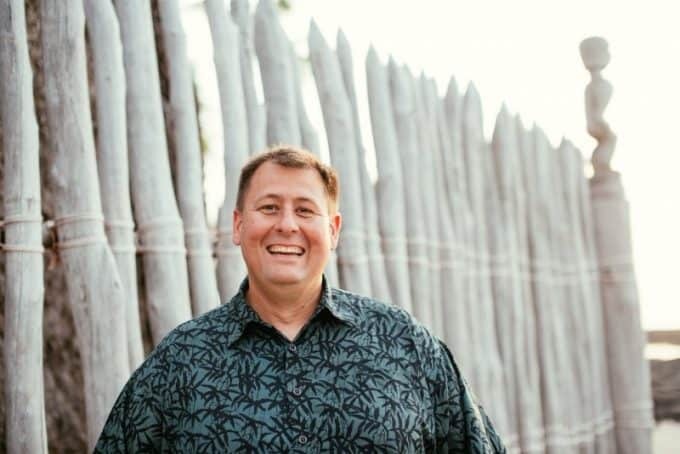 This tour is also available year round and the only tour that takes advance reservations. Plan on taking 1 hour and 20 minutes for this tour. You can only make Advance tour reservations for the Scenic Tour. Scenic Tour Reservations can be made between 72 hours to 90 days in advance and only during the summer season. This tour is offered Early June to Late August and is a strenuous 1/2 mile hike. This tour starts off at the Historic Ranger Cabin and is led with hand-held lanterns, just like the way the cave was originally explored! This hike sounds like a great time but may not be for everyone as there are steep stairs and walking with bending and stooping. The tour is scheduled for 1 hour and 45 minutes. This is a strenuous 1/2 mile, 3-4 hour tour that takes you into the undeveloped portion of the trail that few people get to see! This is definitely not for everyone because not only its physical demands but also you go through some tight spaces. How tight? 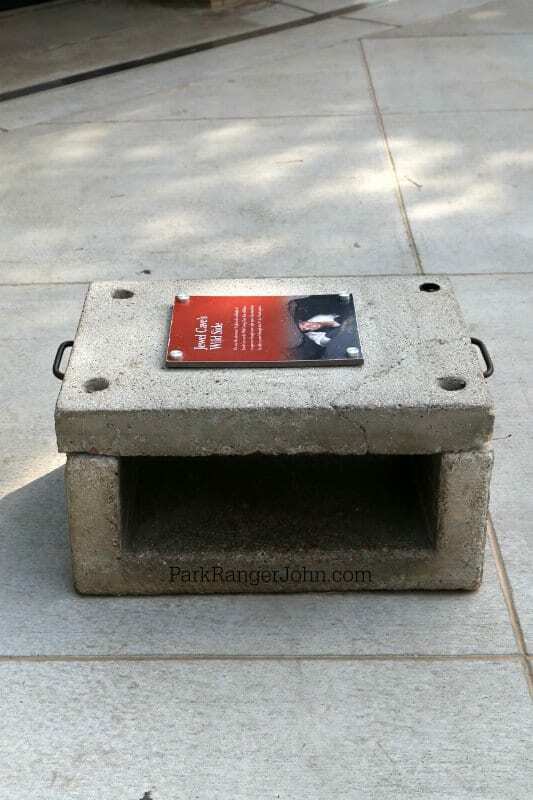 You have to first prove that you can crawl through an 8 1/2″ by 24″ opening a concrete block! You must be a minimum of 16 years old with written permission from your parent/guardian. Wear old clothes for this trip along with soft knee and elbow pads, gloves, lace up ankle high boots with lug soles. Helmets and headlamps will be provided. Roof Trail is a short .25 mile 30-minute trail that starts by the entrance of the cave and is a great way to relax while waiting for your tour to begin. Here is a great chance to see what a forest looks like after seeing fire come through. Canyons Trail is a 3.5-mile 2-4 hour loop. This is moderate with steep inclines and passes through Lithograph Canyon and Hell Canyon. Hell Canyon Trail is a 5.5-mile 2-4 hour loop with outstanding views of Hell Canyon and its surrounding areas. There is also a hiking trail in the adjacent Black Hills National Forest that is overseen by the Forest Service. 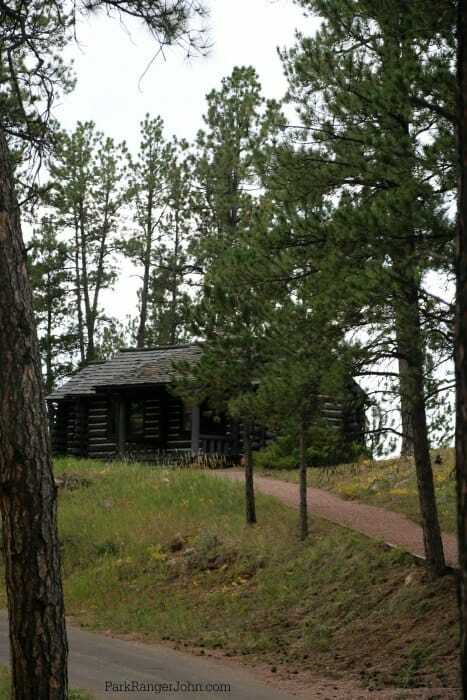 This cabin became home to the first permanent Park Ranger to Jewel Cave National Monument in 1941. This is where Rangers began conducting cave tours led with hand-held lanterns like the Historic Lantern Tour today! Plan on taking a walk, cave tour or interpretative program, be observant and spending time at the visitor center. The payoff is a beautiful Junior Ranger Badge and is available to Junior Rangers of all ages. Winter Schedule: Visitor Center Hours – Open daily from 8:30 a.m. to 4:30 p.m. (Mountain Time). The Monument is closed on Thanksgiving Day (November 23) and Christmas Day, December 25. In the event of inclement weather, visitors are advised to call ahead at (605) 673-8300. Visitor Center hours and tour operations are subject to change during severe weather. Check out this page on the park website for current tours. 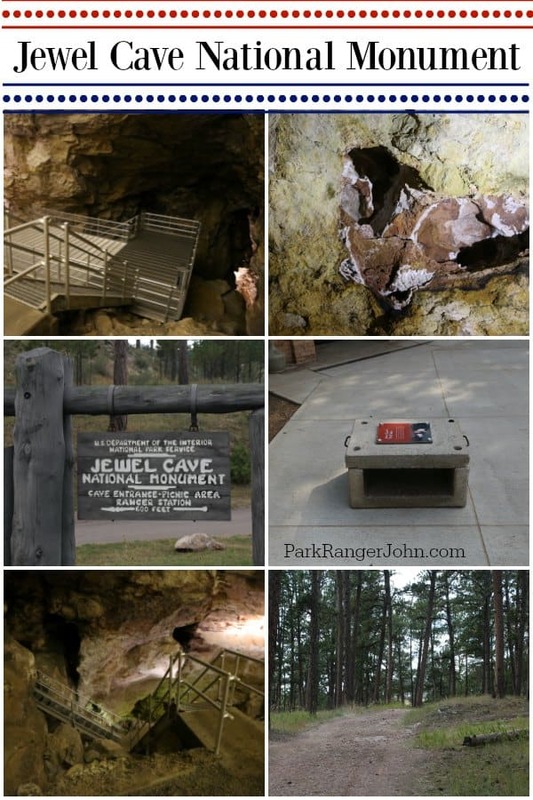 Jewel Cave is located 13 miles west of Custer and 54 miles from Rapid City. There is no food service available at the park! Make sure and bring your water bottles and snacks. Depending on the time of year you are visiting there can be a 3-4 hour wait from the time you pick up tour tickets to when you start your tour. There are several National Park Sites located in the Black Hills of South Dakota making it one of the best All-American Road Trips in America!